Plasma arc welding (PAW) is an arc welding process similar to gas tungsten arc welding (GTAW). The electric arc is formed between an electrode (which is usually but not always made of sintered tungsten) and the workpiece. The key difference from GTAW is that in PAW, by positioning the electrode within the body of the torch, the plasma arc can be separated from the shielding gas envelope. The plasma is then forced through a fine-bore copper nozzle which constricts the arc and the plasma exits the orifice at high velocities (approaching the speed of sound) and a temperature approaching 20,000 °C. 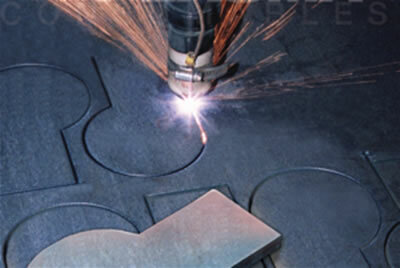 Plasma arc cutting (PAC) Plasma cutting is a process that is used to cut steel and other metals (or sometimes other materials) using a plasma torch. In this process, an inert gas (in some units, compressed air) is blown at high speed out of a nozzle; at the same time an electrical arc is formed through that gas from the nozzle to the surface being cut, turning some of that gas to plasma. The plasma is sufficiently hot to melt the metal being cut and moves sufficiently fast to blow molten metal away from the cut. When used for cutting, the plasma gas flow is increased so that the deeply penetrating plasma jet cuts through the material and molten material is removed as cutting dross. PAC differs from oxy-fuel cutting in that the plasma process operates by using the arc to melt the metal whereas in the oxy-fuel process, the oxygen oxidizes the metal and the heat from the exothermic reaction melts the metal. Unlike oxy-fuel cutting, the PAC process can be applied to cutting metals which form refractory oxides such as stainless steel, cast iron, aluminium, and other non-ferrous alloys.